Smithtown Industry Advisory Board Secrets of Successful Collaboration Smithtown Industry Advisory Board. 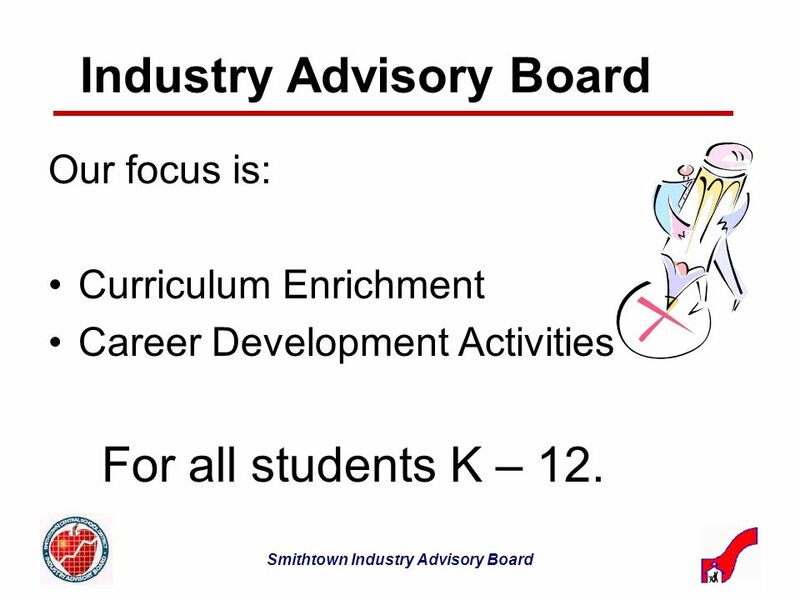 2 Smithtown Industry Advisory Board Industry Advisory Board Our focus is: Curriculum Enrichment Career Development Activities For all students K – 12. 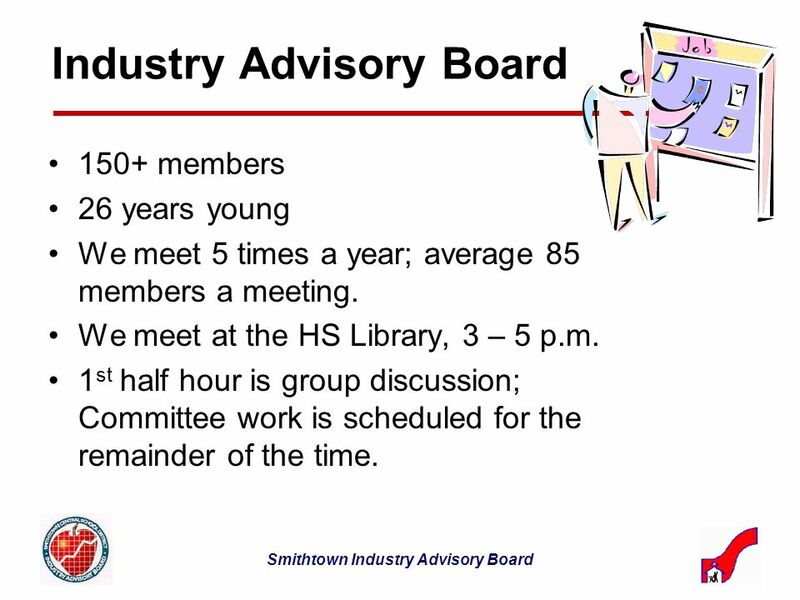 3 Smithtown Industry Advisory Board Industry Advisory Board 150+ members 26 years young We meet 5 times a year; average 85 members a meeting. We meet at the HS Library, 3 – 5 p.m. 1 st half hour is group discussion; Committee work is scheduled for the remainder of the time. 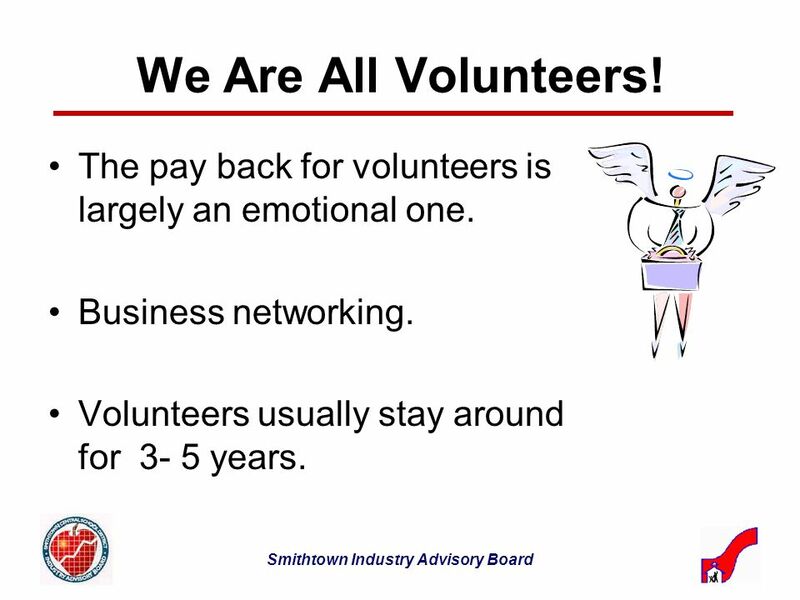 4 Smithtown Industry Advisory Board We Are All Volunteers! The pay back for volunteers is largely an emotional one. Business networking. Volunteers usually stay around for 3- 5 years. 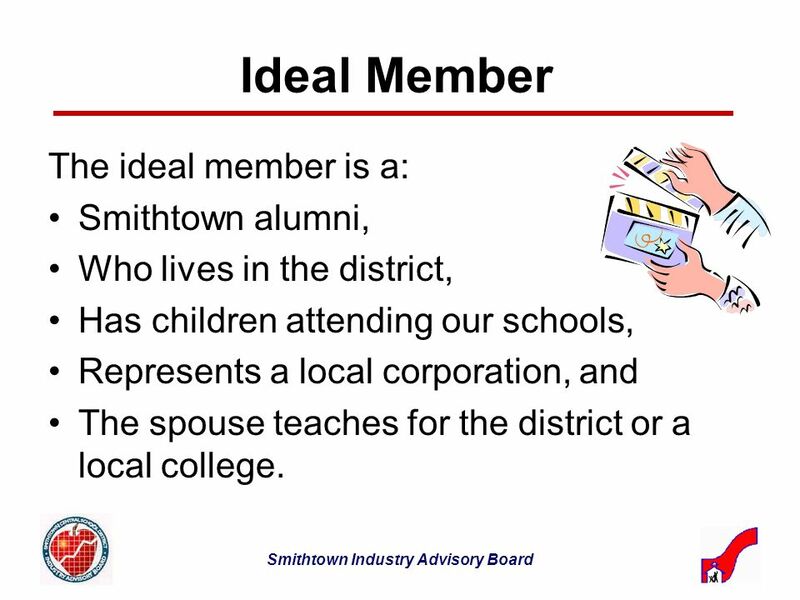 6 Smithtown Industry Advisory Board Ideal Member The ideal member is a: Smithtown alumni, Who lives in the district, Has children attending our schools, Represents a local corporation, and The spouse teaches for the district or a local college. 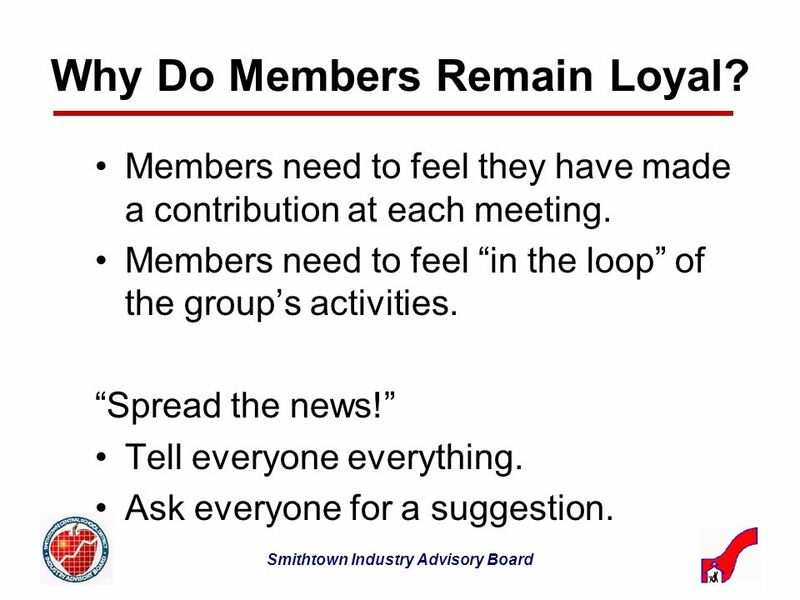 7 Smithtown Industry Advisory Board Why Do Members Remain Loyal? Members need to feel they have made a contribution at each meeting. Members need to feel in the loop of the groups activities. Spread the news! Tell everyone everything. Ask everyone for a suggestion. 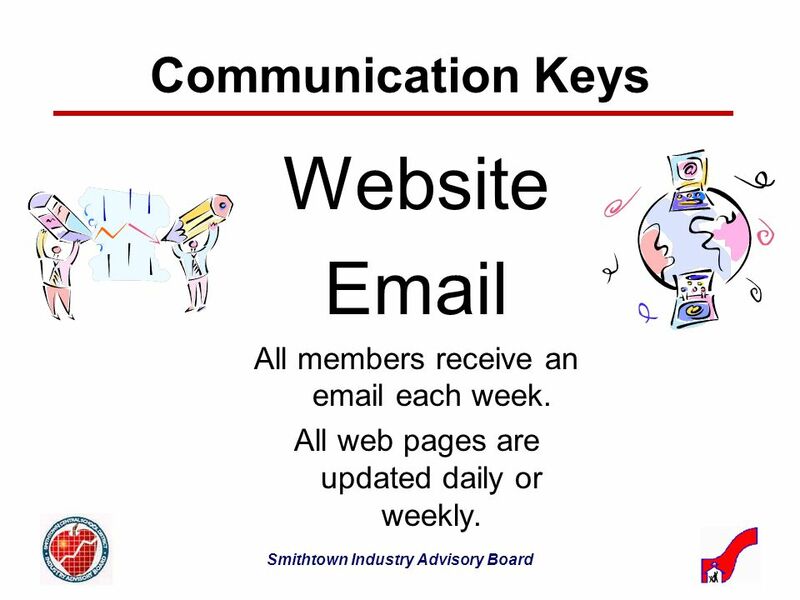 8 Smithtown Industry Advisory Board Communication Keys Website Email All members receive an email each week. All web pages are updated daily or weekly. 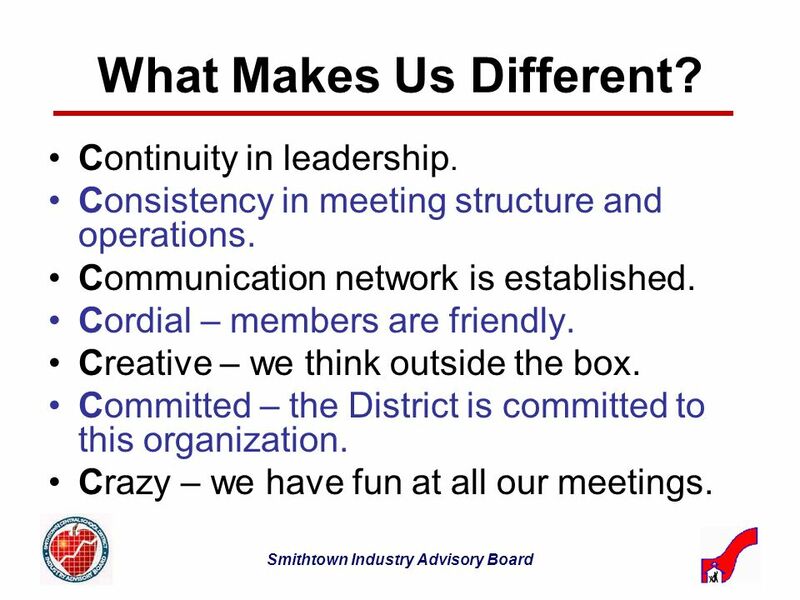 9 Smithtown Industry Advisory Board What Makes Us Different? Continuity in leadership. Consistency in meeting structure and operations. Communication network is established. Cordial – members are friendly. Creative – we think outside the box. Committed – the District is committed to this organization. Crazy – we have fun at all our meetings. 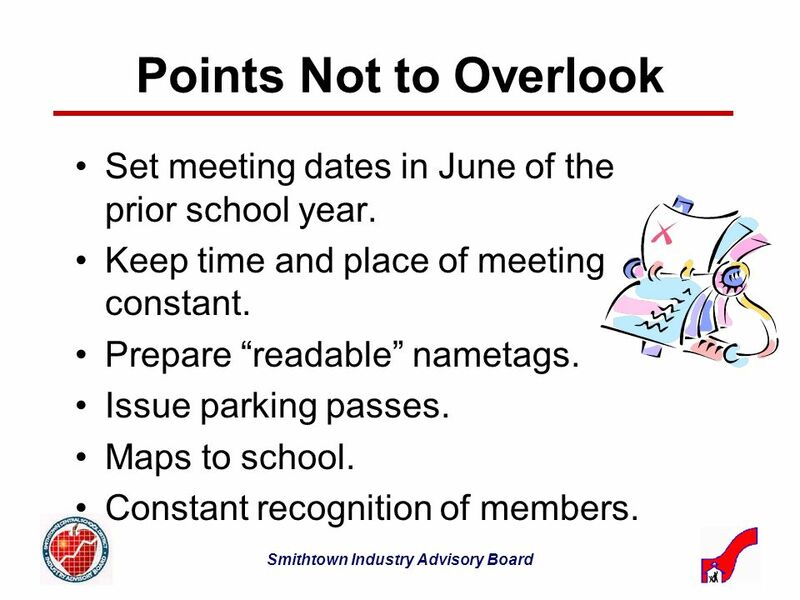 10 Smithtown Industry Advisory Board Points Not to Overlook Set meeting dates in June of the prior school year. Keep time and place of meeting constant. Prepare readable nametags. Issue parking passes. Maps to school. Constant recognition of members. 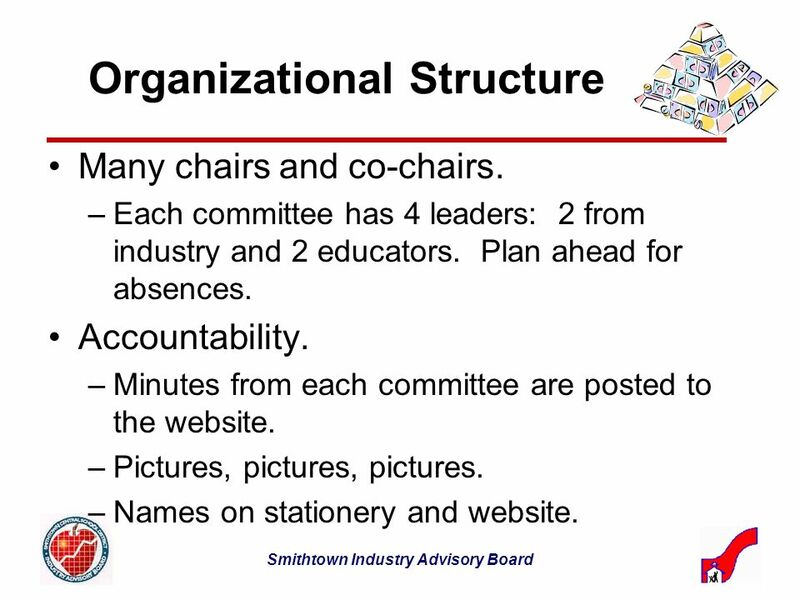 11 Smithtown Industry Advisory Board Organizational Structure Many chairs and co-chairs. –Each committee has 4 leaders: 2 from industry and 2 educators. Plan ahead for absences. Accountability. –Minutes from each committee are posted to the website. –Pictures, pictures, pictures. –Names on stationery and website. 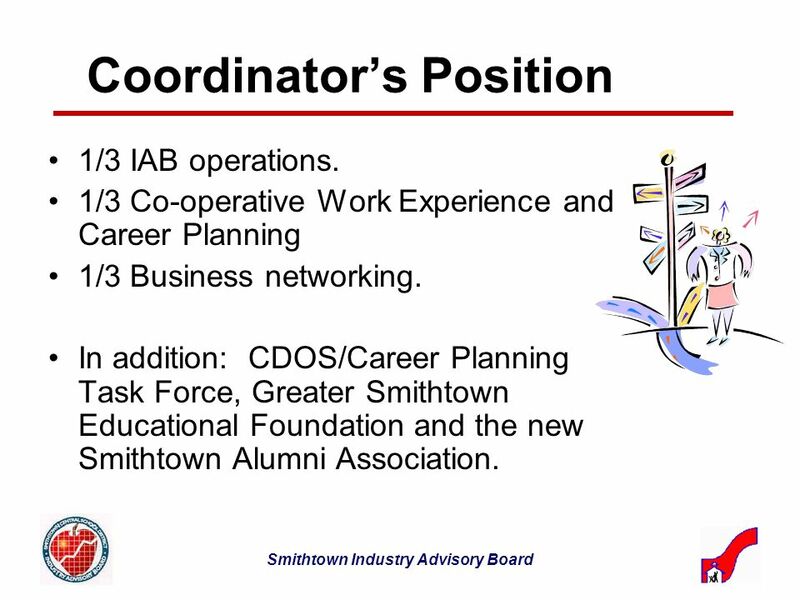 12 Smithtown Industry Advisory Board Coordinators Position 1/3 IAB operations. 1/3 Co-operative Work Experience and Career Planning 1/3 Business networking. 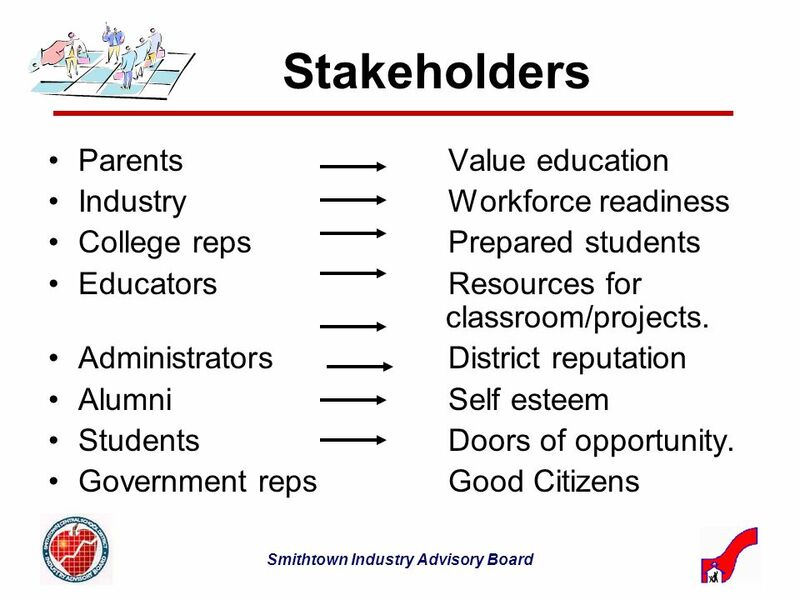 In addition: CDOS/Career Planning Task Force, Greater Smithtown Educational Foundation and the new Smithtown Alumni Association. 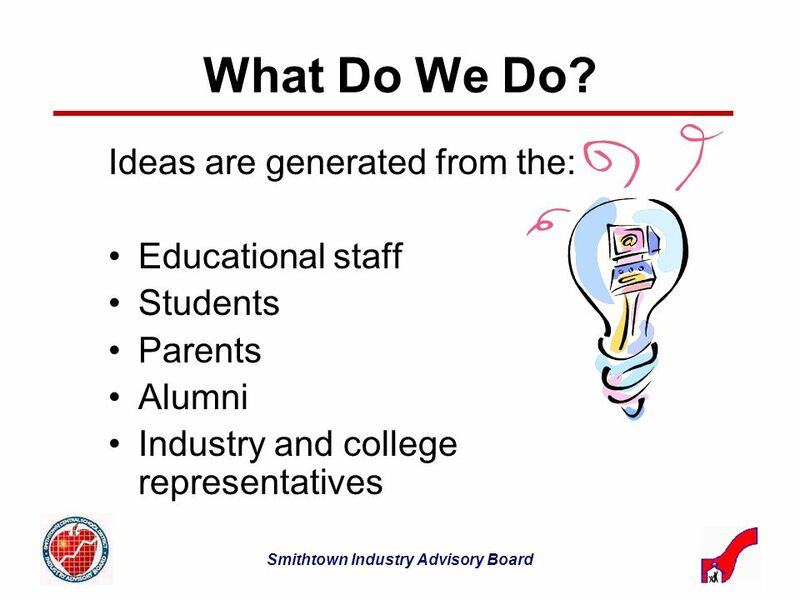 Download ppt "Smithtown Industry Advisory Board Secrets of Successful Collaboration Smithtown Industry Advisory Board." Families InvolvementAction Team FIAT TRAINING March 4, 2010. Play video as people enter Engineering Program.wmv Mahtomedi Engineering Leadership Program. Informational Meeting Copper River School District FEA. Stratford LG PC Meeting September 9, Parent Committee Meeting Agenda – Sept 9, 2009 Welcome/Parent Committee (PC) Overview Introduction of Parent. What Does It Mean To Be A Professional? Jennifer L. Ness Canisius College. School Community Councils Working Together for School Improvement. Amy Jenks, Grant Coordinator NH RESPONDS Grant (SPDG) (603) 1 New Hampshire’s Advisory Board for SPDG. What will your project consist of? How will your project operate? What forms do volunteers fill out? Where do you send forms and photos? Organizing a Successful. Network for Teaching Entrepreneurship Startup Summer Presenter - Tara Bellevue. BUTCH SPARKS PAST DEPARTMENT COMMANDER.  To provide “Service” to our veterans, their families and their communities is as solid today, in a period of. Y12 PARENT INFORMATION 2012/13 WELCOME TO FARMOR’S SCHOOL SIXTH FORM. BRINGING ALL THE PARTNERS TO THE TABLE FOR THE GOOD OF THE STUDENTS AND THE COMMUNITY! Establishing a Regional Industry Intern Project. Creating a Movement Creating a Movement. Secondary Mathematics News and Next Steps Staff Development Day March 18, 2011. Energy Express … where breakfast, lunch, and learning don’t take a summer break.